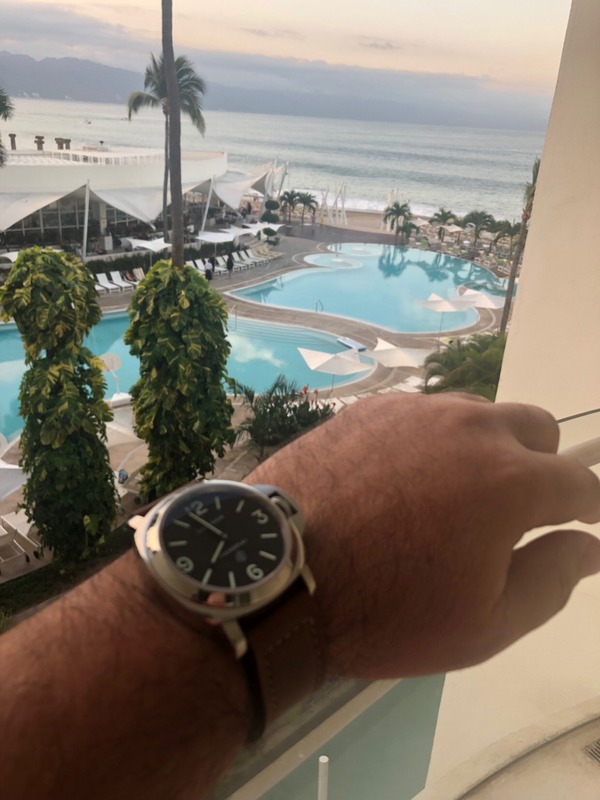 PANERAI 2019: The Beginning of a New Scam Era! The price of the kind of Autoclave required would not be cheap for these cases. Compare the price difference between a steel brake disc and a carbon ceramic one. I agree with most of what the OP said. I think the crayola release of 2019 along with the goofy trips is ridiculous. Panerai msrp vs resale price is a good reflection of where the brand is heading. IE the 1305 msrp is 11,500 , you can find them all day for 6500 or less. The carbotech and the similar breitling breitlight are both showing poor resale pricing. The increase in 2019 msrp is going to make the 19s even worse. I came to panerai for the subs , tough , brushed finish unique look based on durability and readability. Now the lume markers are baby blue..... I think they are lost. I don't know if I agree with everything the OP posted. I know little about the technical details of wristwatch manufacturing. Based on what has been presented to the public at SIHH 2019, I think Panerai is doing more of the wrong thing. This obviously my opinion alone and only based on the offerings we have seen. I agree that the Submersibles offered are way overpriced (even for current market standards). An AP Royal Oak Diver (while perhaps not as iconic) is superiorly made for less money than what Panerai is offering. After the interview we saw with the new Panerai CEO, I was hoping for refinement of the regular production line. I was looking for Panerai to simplify and streamline. Their website doesn't even make sense. Lumping all Radiomirs and Luminors into a single category for the untrained buyer makes discrimination extremely difficult. This doesn't simplify the process; it confuses the buyer. I never saw a problem with categorizing the different models by case shape. Rather than just spotlight the Submersible line or offer something interesting (I felt the BMG-Tech was a cool novelty), they have oversaturated the line with things we have already seen. I'll continue to buy Panerai I like. There's still a lot of great pieces out there. I am just not as optimistic about the future. Beautiful! And model numbers are quite fitting! Well, all such things as these price increases affect each one of us differently. A watch is not only a luxury item to me, but a very emotional acquisition as well. As such, the way I perceive the latest changes, introductions and prices has severely tainted my feelings about the brand. Today, for the third time in a week, I strapped on my beautiful PAM 721, kept it on my wrist for a few minutes, took some photos, did a post on WRUW, then took it off my wrist and wore my Zenith El Primero bronze. I can't quite decide how I would classify my feelings, but I do know they come from the heart. Perhaps, it is a bit of a defeatist attitude, and I should get over it and enjoy the models I have. The 721 is the Panerai that has most grabbed me, from the start when it was introduced in 2017. At the time, I could not afford it, and thought that I would be lucky to even see one. I was mesmerized. Then the Panerai Boutique opened in Vancouver, miraculously one appeared in the display case, and I bought it. Now I am not sure what I am going to do, with it or the other three models I own. Don't get me wrong. I am only conveying my sincere thoughts, and an example of how changes like this can affect us. Everyone should have such a dilemma! If worse comes to worst, I end up selling them all, I can always get a brand/model I like better. I love the 721! Keep it! Hopefully the watch came with that 20k. I'm still trying to wrap my head around how I could possibly spend 20k at a Mexico resort. My last one was a full week, two offshore big fish excursions and a private dive trip for less than 10. Maybe I'm not doing it right. I agree that the Submersibles offered are way overpriced (even for current market standards). An AP Royal Oak Diver (while perhaps not as iconic) is superiorly made for less money than what Panerai is offering. May I know if you owned an AP RO diver to make that comment? I think that comment is common sense. Panerai is not on level of AP. That doesn't make Panerai a bad brand. I own three Panerai. I obviously do not own any of the new models. There is no way that any of them are worth what they are charging (experience or not). I do not own an AP RO Diver, but I have worn both the steel and the ceramic versions. I have a colleague who owns the ceramic version (I have handled it many times) and the steel I have tried on. If I am looking at spending 20-30k on a dive watch, I am already in steel AP territory, precious metal Rolex territory, and PP Aquanaut territory. I just don't think Panerai (as great as the brand is) stacks up those competitors at that price point. Thanks for the encouragement. If I let go of any of my Panerai watches, it will be the last to go! Not just because it is my favorite, but with the direction the company is going, who knows when or if they will do such a model again. Just curious, why would the direction of the company affect your love for the older pcs you own? If anything it should make you love them more no? I'm writing here again just to share my thoughts. My concluding thought is that panerai is a brand that many people love to hate and bash. Release high tech pcs, ppl bash them. Release heritage pcs, ppl bash them. It is the one brand that appears to be unable to do anything right in ppl's eyes. This may be the one brand that ppl set their bar so high that their expectation can never be met. If you care to observe, literally every year, ppl will say the brand is dead, bash their new releases, question the brand's direction, criticise their strategies. Yet after a few years, ppl will say that the previous year's releases are actually good. I know I've been seeing the same bashing comments and threads for many years already. And mostly from ppl who don't really know much about the brand. As for me, I love the brand since the time they are impossible to find and calling for a premium. Many pieces have come and gone but to-date I'm still very much in love with the brand and has the most pcs in my humble collection. I can't truthfully answer that, all I know is that if I try to explain it, I really don't know what I would say. Many feelings we have about various things in life, really can't be explained. Right now, my heart is not in Panerai, and I am hoping that will change. I never just acquire a watch, I also have to have a pride in a company, not just for before, or for the present, but the future as well. Anyway, people can agree or disagree, but I have to go with my heart. i did. I really like Panerai as well and the new submersibles in particular. No way i would pay more for one than an AP diver though. The main difference is you can still get an entry level Panerai for a fraction of that price where as the AP diver is about as entry level of an AP as you can get. So if you just want a Panerai, spending 20+k is not the best value proposition and if you want a really expensive Panerai then there are other options from other brands. Its a weird position to put themselves in as im not sure who they are targeting.... the LE + experience actually makes more sense to me vs the 20k regular watch as at least that one offers something that makes it hard to compare to something else as it is truly different. Panerai is getting a Hublot feel to it..
What is amazing to me is that they would do this even though that style of watch (over the top colorways and exotic materials) is DOA in the market with the exception of RM. I was looking at a catalog I have from 2002....and wonder if they had just stuck to that...continuing to limit distribution and release the occasional LE....(I stress occasional), where would the brand be today? The market rewards brands with timeless designs, not contemporary styled chaos with bunches of references at crazy prices..
panerai are certainly aiming at the younger generation market, who love new materials and trendy designs. but I doubt too many young people nowaday could afford to splash 4000 dollars on one watch. dont know what the new CEO is thinking. Always great to read your posts!! Well, good news is that I am starting to think more rationally this week. I took a long look at the 4 models I now have, and the time and effort I spent learning about all the history of especially two of them, the PAM 673 Marina Militare and PAM 721 "Kampfschwimmer". Like you say, stick with the old skool stuff! Sometimes, I perhaps take things almost personally. "How dare the company change things, and start over charging for these models without my permission!" Admittedly, I formed my collection in a very short amount of time. It seemed that, soon as the local Boutique opened, they had quite a few models that I never even thought I would see. Let alone buy. I am not one for buying online, a model I have never seen nor from a seller who is unknown to me. So, my sole source for Panerai is really the Boutique. There are no ADs here in Vancouver. Anyway, there is another angle as well. Now, I have never purchases any of my watches based on resale value. Except in the case of my gold watches. You have to be damn sure that you are not going to resell most gold watches, as they seem to depreciate a lot more than stainless steel. Well, with all the emphasis on Submersible models, if I do decide to sell any of mine down the road, it could be of benefit. I was amazed to see the other day that the 721 is now being sold for quite a bit higher than MSRP. Some of the other models not doing that well, but perhaps this whole direction Panerai is taking will benefit the resale market somewhat. Time will tell. I did flip my 720, though, as I ended up much preferring the 721 with the Anonymous dial, and the 720 got no wrist time. Now, I have a different watch that will be worn a lot more. So, I am going to relax now and see how I feel about all this in the next weeks. I do tend to feel, when I purchase a watch, I am also buying the brand, as I do lots of research on both. I never just see a watch in the display and buy it because it looks nice, I have to have more of an attachment than that. The thing is, with Panerai, there are many highs and many lows. But, IMHO, that’s what passion is all about, and what makes it fun. It’s true, there have been, and will be, many things done by Panerai that we as fans will criticize, but there’s a lot of fundamental style and goodness, that I think we will always find something to love. Long story short: enjoy what makes you smile and don’t sweat the rest. This is just spot on. I will refrain from mentioning specific trends in watches so as not to offend, but we are already seeing materials and styles used only 2-3 years ago fall out of favor. Rather than focusing on and refining what has made the brand popular(steel Luminors and Radiomirs), Panerai is making extremely expensive mechanical G Shocks.